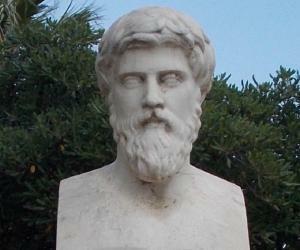 Plutarch was a famous Greek biographer and essayist. This biography profiles his childhood, life, works, achievements and interesting facts about life. 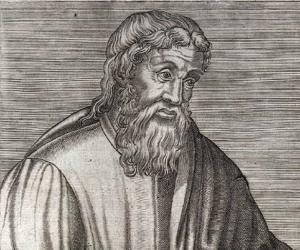 Plutarch was a prominent Greek biographer and essayist. Best known for his in-depth biographies of famous Romans and Greeks detailed in his writings of ‘Parallel Lives’, he was equally renowned as a moral essayist through his work of ‘Moralia’. 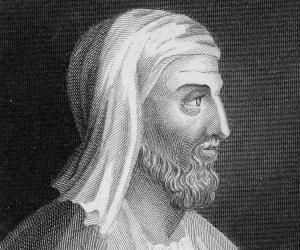 Plutarch has often been compared with Augustine of Hippo and Aristotle, two predominant philosophers of their time. His writings on famous Greek and Roman personalities are not only considered manuscripts of information; rather they are looked upon as acollection of intense study of character. His work doesn’t depict the lives led by famous personalities, but the grounds on which their disposition shaped their lives. After achieving superior recognition and earning admiration of both commoners and kings, Plutarch was granted Roman citizenship, since his work was not restricted only to the Greeks. On attaining Roman citizenship he came to be known as Lucius Mestrius Plutarchus. Plutarch was born into an opulent family around the year 46 to 47AD as derived from his writing ‘On the E of Delphi’. He was born in a city of Boeotia named Chaeronea, located in central Greece. Historians aren’t certain about who his father was, but evidence from his own testimonies suggest that it was Nikarchus. His grandfather was Lamprias, after whom his sibling was named. In Plutarch’s essays, we find the mention of two siblings, both brothers. One named Timon and the other Lamprias. Historians presume that Plutarch might have been more affectionate towards Timon as he speaks of him fondly in his works. He received formal education in 66-67, at one of the most reputed institutes of that time, the Academy of Athens, where he studied under the guidance of Ammonius, a Greek philosopher with rich knowledge of both Aristotle and Plato.Plutarch was approximately 20 years old at that time. Ammonius had aninclination towards metaphysical studies; he often probed religion and its several rites. It is probably under his tutelage that Plutarch was influenced and took to metaphysical studies as well. 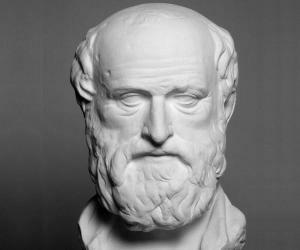 He received liberal education under Ammonius; he studied Greek and Latin literature, philosophy, natural science, medicine, physics, rhetoric and mathematics at Athens. Plutarch lived for several years in Athens.He was so revered as an Athenianthat he was sent as an ambassador of his town several times to Alexandria, Egypt and Rome. He soon took Roman Citizenship and was named after his sponsor, Lucius Mestrius. Travelling mainly between Greece and Rome, he was later appointed as the magistrate of Chaeronea. Historians reckon that the major reason for him to be rooted to his hometown was that he had a close bonding with his family. Moreover, his family had the required finance that he could use in order to study and travel. He worshipped Apollo, the ‘Greek God of Music’, at the ‘Temple of Apollo’ in the Delphi Oracle, which was about 20 miles away from Chaeronea, and became one of the two priests there. Back home, Plutarch himself became a lecturer; he also provided education on philosophy and ethics in various parts of Italy during the years 75 to 90. He educated many Romans and Greeks. It was at this time that Emperor Trajan visited Plutarch during one winter and honoured him by gifting him the ornaments of ‘consul’. According to this, he could henceforth wear a golden ring on his finger and a white toga with a purple border as a sign of merit. He wrote several biographies of famous emperors and also essays and letters. His writings reflected his major influence as a Platonist but at the same time also portrayed the principles of Aristotle’s ‘Peripatetics’. His assumptions of religion andscepticism ofsuperstition heavily shaped his writings, along with his ardent belief that God was only ‘one-being’who was called by various namesby worshippers. Plutarch received more than just a righteous status in society. He also earned the admiration of many during his time, such as his tutors, great scholars and emperors, and proved to be a benediction for future historians. His first major work was published during the rule of Nerva, probably between 96 and 98. It contained biographies of great men from Augustus to Vitellius and was titled ‘Lives of the Roman Emperors. As he became a voracious biographer, he penned one of his most celebrated works, ‘Parallel Lives’. In this, he compared two emperors or great men of Greece and Rome, belonging to the same era and drew similarities and dissimilarities between the two, beyond meagre external appearances. His aim wasn’t to simply write a historic review of their lives, but rather to discern the good and evil impact they had on society and on the destiny of other men, carefully highlighting the governing traits of their characters. He provided the first written works on the Spartans in his ‘Saying of Spartans’ and the ‘Sayings of Spartan Women’. However, these worksfaced numerous controversies based on lack of evidence. The fact that he had visited Sparta but the customs that he wrote about weren’t existent during his time, made his writing on the Spartan’s derivative. Thus, he based his writings on fragments of information left by historians who themselves wrote about Sparta after its former decline, and not what he had witnessed himself. He wrote extensively on the ‘Life of Alexander’ as compared with the ‘Life of Caesar’, carving anecdotes of real life events and incidents,which have not been found in any other manuscript. He directly proclaimed the righteous and wrong deeds and temperaments of the two emperors based on several anecdotes. Many of his biographies and essays have been lost over centuries. 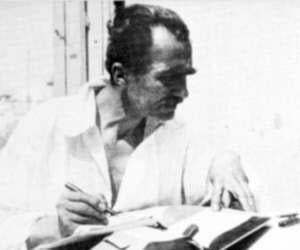 All that could be gathered of his works was put together and titled ‘Moralia’. It comprised of 78 essays and speeches.Some of the topics that it covered were- fraternal affection, affection between siblings, and religion. The ‘Moralia’ also known as ‘Ethica’ contained a satirical dialogue between Homer's ‘Odysseus’ and an enchanted pig of ‘Circe’, that is considered a legendary segment of Ancient Literature. He was deeply intrigued by physics, especially metaphysics. Some of his works pertaining to this field are - ‘Timaeus’, ‘On the Generation of Soul in the Timaeus’ and ‘On Isis and Osiris’. In 68, he married the daughter of Alexion, Timoxena. The exact number of their sons has not been clearly identified by historians, but it is suggested that they had four sons about who he wrote extensively. Plutarch also had a daughter, named after her mother Timoxena, but she died at the age of two. Plutarch, in a letter to his wife, mourns the death of his daughter and consoles his wife, giving her hope of a reincarnation. The life of the venerated biographer came to an end in the year 120. What seems to be most unfortunate of all, is that although Plutarch was a matchless biographer and essayist, there was none to write his biography. The events that have been gathered about his life are purely based on the evidence historians have derived from his own pieces of work providing references to his family and his childhood. It is true that Plutarch had left generous information for historians and writers of the future. But he also left a great part of himself behind, in his opinions, descriptions, and implying anecdotes. His son Lamprias put together a catalogue of his father’s work. But it is not considered authentic as it does not include all of his works and it is not in chronological order; yet it is equally fundamental as a record of Plutarch’s works. It was mainly in the 16th Century, during the period of Renaissance, that his works were brought to light. Humanists and Dramatists such as William Shakespeare made clear references to his work through their plays and scripts. However, due to a sudden rise in the ‘Romantic Movement’ and the decline of rigid virtues in the 19thcentury, gradually Plutarch’s writings and ideologies were shadowed. As against popular belief, it has been validated that Plutarch had first worked on ‘Moralia’ after which he began working on ‘Parallel Lives’, but since the ‘Moralia’ embodies his leftover work, it was published after ‘Parallel Lives’.